Clth, 9.5 x 6.5 in. / 160 pgs / illustrated throughout. 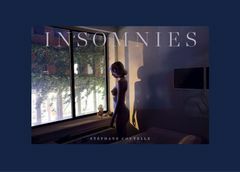 Stéphane Coutelle, a Parisian photographer and painter, presents Insomnies, a series about nighttime, and those infinite moments of half sleep, half waking, when the mind wanders freely and without constraint. This publication features his intimate portraits of women and nocturnal landscapes. FORMAT: Clth, 9.5 x 6.5 in. / 160 pgs / illustrated throughout.